Having a garage signifies bearing some obligation. The flooring will get grimy, particularly in the event you perform in it a lot and it'll be quite difficult to scrub. The harsh New England weather requires salt to be used on the roadways and highways which result in running off underneath the vehicle while damaging your existing concrete floor, the epoxy coating will prevent this from happening while creating a seamless bond to the existing concrete. ​You'll be able to quite readily discover all sorts of paint color alternatives along with the costs can be quite inexpensive while protecting the existing concrete from blemishes and stains, with regards to the true quality of the paint. You may select between: Epoxy, Latex, Pu or oil-based paint. These can be wonderful choices, except the oil-based paint, which isn't really permanent. It doesn't matter which one that you pick provided that it meets your requirements. 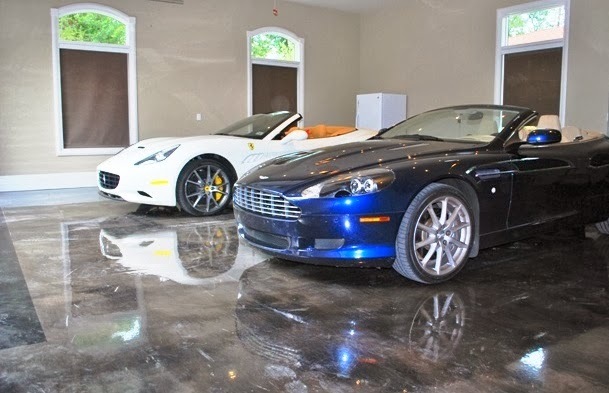 ​Garage flooring paint coats the complete area of your garage flooring and seals the flooring from the kind of issues most homeowners have to deal with.. To clean engine oils along with other liquids from your garage floor can need incredibly harsh solvents, and these resolvents should not be allowed to touch your skin. Having to constantly clean your garage flooring with harsh solvents is not a good choice. ​You can apply garage floor paint, or a garage flooring coating, to prevent the clean-up of harsh solvents, and discolorations. The easy wipe-up of route and motor oils and debris isn't any more difficult than wiping a kitchen counter for those who have used a garage floor paint to protect your flooring. ​Straightforward addons for example flooring paint is certainly worth, if you prefer to maintain your house's worth at upper limit and carry on the wonder of your garage the Protection is needed by your garage floor also. If you remodel your home, don't miss the excess room inside your home. It's a great asset of your property also. And if it's not kept up its appearance as much as the remaining elements of your home are, it may pull down the market price of your property unnecessarily. ​You can employ common house paint on your flooring, but the outcomes will never be of the same quality as the ones of urethane and epoxy paint. Moreover the epoxy and urethane options provide substantially better protection plus a bigger shine end for your flooring. ​Additionally, any grime and liquids your engine could have picked up in the route will drip onto the ground when your vehicle is parked. All this stains and gathers your flooring. If leaves blow in to your garage when you're parking, and also you miss them-they can create a brownish/reddish spot in your garage flooring that will be nearly not possible to escape. Garage flooring paint will help with each of those issues.